RPM Rear Bumper for the Traxxas Slash 2WD, Black Discounts Apply ! RPM81002 - RPM Rear Bumper for the Traxxas Slash 2WD, Black. After releasing our front bumper for the Traxxas Slash 2wd, we immediately started receiving customer requests for an RPM rear bumper. In typical RPM fashion, we don�t just make replacement parts; we make the best replacement parts possible! So what sets the RPM rear bumper above all else? We started with our incredibly durable materials and created a bumper that is based off of current full-sized Short Course and Baja style rear bumpers. Full-sized rear bumpers are wide and flat and our scale version is exactly that, for the ultimate in rear-end protection. 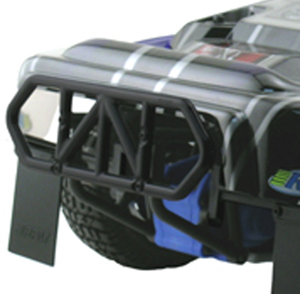 RPM rearChrome Rear Bumper bumpers will stop most rear impacts from affecting the truck in any negative way.